You gaze upon the photo you've just uploaded to Instagram: a masterful sunset capture, indeed, the Valencia filter giving it that whisper of intrigue. You think to yourself, Damn, this looks good on my phone but it would look SO GOOD on my pinky fingernail. 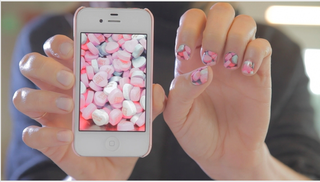 It could happen, with NailSnaps. Using an app, you can decide how your images splay out across your 10 digits, adjusting the pattern to fit your needs (and your gargantuan thumbnail). After that, it works kinda like any photo printing app, with the stickers printed and shipped to your home salon. You trim and apply the nail polish stickers, which require no extra glue or drying time. The colors, at least in these photos, look pretty vibrant as well.